"Quick way to make fall-off-the-bone ribs in the Instant Pot®!" Pour broth into a multi-functional pressure cooker (such as Instant Pot(R)). Add ribs in a teepee formation. Close and lock the lid. Select high pressure according to manufacturer's instructions; set timer for 30 minutes. Allow 10 to 15 minutes for pressure to build. Release pressure carefully using the quick-release method according to manufacturer's instructions, about 5 minutes. Unlock and remove lid. Move ribs to the baking sheet using tongs. 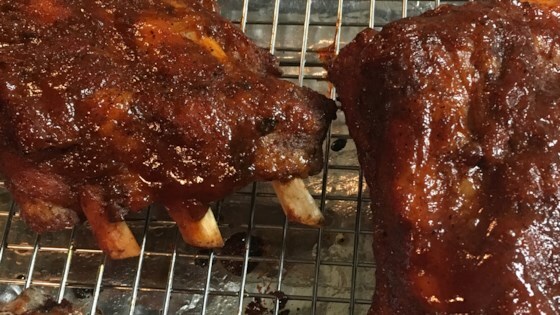 Brush ribs on all sides with barbeque sauce. Made exactly as directed. This was my first time using the Instant Pot and the ribs were amazing!! Seasoned just right and fall off the bone. Will definitely make again!! Excellent recipe, only deviation was we used half the salt and used sea salt. So tender, fall off the bone, and the flavoring is spot on. Thank you so much for the recipe!